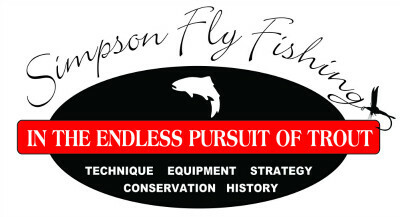 Almost every fly fisher loves to fish dry flies when the opportunity presents itself. The game is of course to see a surface-feeding trout, and to present a fly as naturally as possible. This requires that the fly drift at the same speed as the water in which it sits. But often there are intervening currents or eddies which are moving at different speeds. They can pull or hold the fly line, which then moves at a different speed than the fly. When this happens, the fly is pulled or dragged unnaturally across the water’s surface. This is referred to as “drag” in fly fishing parlance. Drag is the nemesis of the fly fisher, whether fishing wet or dry. Trout recognize the abnormal movement of the fly, and will almost always ignore it. Worse yet, they may scurry to cover, and alarm other nearby fish. Therefore, one of the keys to successful fly fishing is extending the drift, drag-free, as long as possible. This provides an enticing presentation of the fly to more trout, on each and every cast. The skilled fly fisher can reduce the likelihood of drag and extend the drift in two basic ways. The first opportunity occurs during the cast, that is, before the line lands on the water. The second occurs after the line has landed on the water. It is always preferable to anticipate drag problems and proactively address them before the line has hit the water. The first step is to study the water before the first cast, and to recognize potential drag problems. 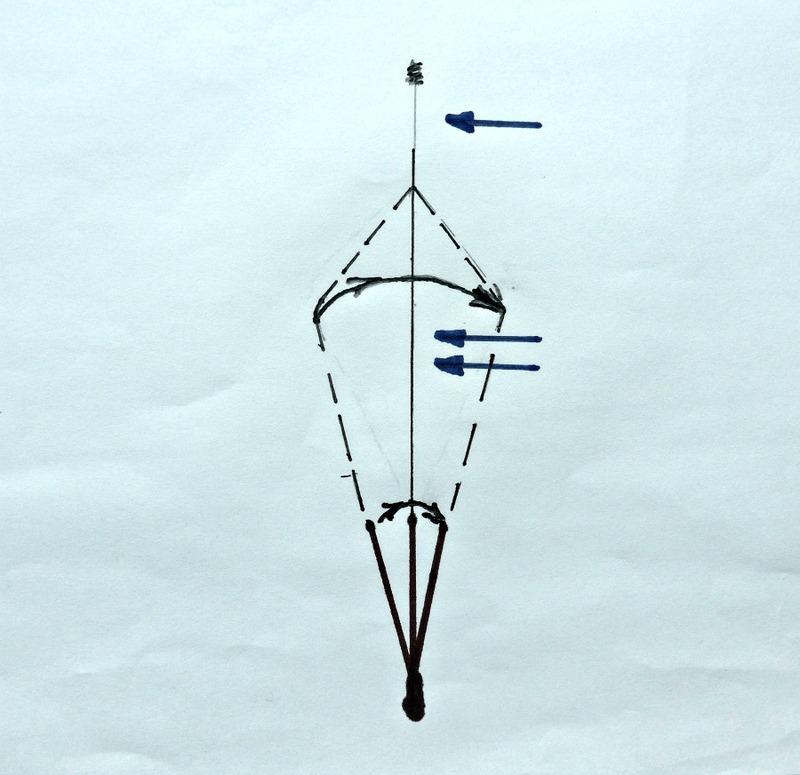 The second step is to consider how and where to cast the line in order to delay or avoid drag. A common scenario is casting across a faster current to fish slower, bankside water. The midstream current will drag the line, and shorten the effective drift. There are a number of casting motions that can prevent this, and help extend the drift. They place the line on the water with intentional slack, which can absorb the faster moving water and prevent drag. Collectively, they are referred to as “slack-line casts”. There are several casts that will place extra line or slack on the water. They vary in degree of difficulty and the amount of slack they result in. Let’s begin with the simplest. The easiest way to put some slack line on the water is to overpower the cast and abruptly stop it. The line will bounce back, leaving some slack. This is often referred to as the “bounce-back” cast. To add some additional slack, the line-hand can be pulled sharply back and the rod-tip raised just as the line straightens. The line will then settle onto the water, with several feet of slack. Many times however, the “bounce-back” cast will not be able to provide enough slack. Another fairly easy cast that will result in more slack is the “parachute” cast. This cast begins by throwing the line a bit higher than normal, at roughly a forty-five degree angle above the water. As the loop unfolds, the rod is tilted backward to an upright or vertical position. When the line has straightened, the rod is quickly lowered to a fishing position. The line will fall to the surface with a length of slack at least equal to the length of the rod. Another useful cast is variably referred to as a “wiggle”, “serpentine”, or “S” cast. It is more difficult, but will provide even more slack line. This cast begins with a normal casting motion. On the final forward cast, the rod is wiggled back and forth, side to side. This results in a series of “S” curves in the line. Although more difficult to perform, the “S” cast is the most adjustable of the slack line casts. That is, the number and width of the curves is easily varied, and therefore matched to the needs at hand. For long casts over widely disparate current speeds, it is the only cast likely to result in adequate slack to sufficiently extend a drift. The next group of useful casts consists of the “reach” and “curve” casts. Although they are frequently used to place slack into the line, they can also be used to help in other situations. Hence, I have grouped them separately. Sometimes we are faced with placing our fly into faster water, while the line lies in slower or nearly still water. In such instances, slack line, lying in the quiet water in front of the caster, will provide no assistance toward extending the drift. The first and easiest approach is to use a “reach” cast, sometimes referred to as an “aerial mend”. This begins with a normal forward cast. But just as the loop is about to unfold, the rod is moved to a nearly vertical position. From the vertical position, the rod is then pointed downstream, placing the line on the water in the direction that the fly will be drifting. The next cast to consider in this situation is the “curve” cast. It is more difficult than the “reach” cast, but will place more line ahead of the fly, further extending the drift. To perform a curve cast, the rod needs to be canted to the right for a left curve, or to the left for a right curve. The final forward cast should be overpowered a bit, and the line brought to an abrupt stop. This will snap the line into a curve. The picture below compares the line placements of the “reach” (dotted line) and “curve” (solid line) casts. If the fly lies in slower moving water than the line, both the “reach” and “curve” casts are helpful. The casts are simply made in the opposite direction of the illustration above, placing the slack line upstream of the fly. Curve casts can also be used to place a fly behind in-stream structure, such as large rocks or trees. 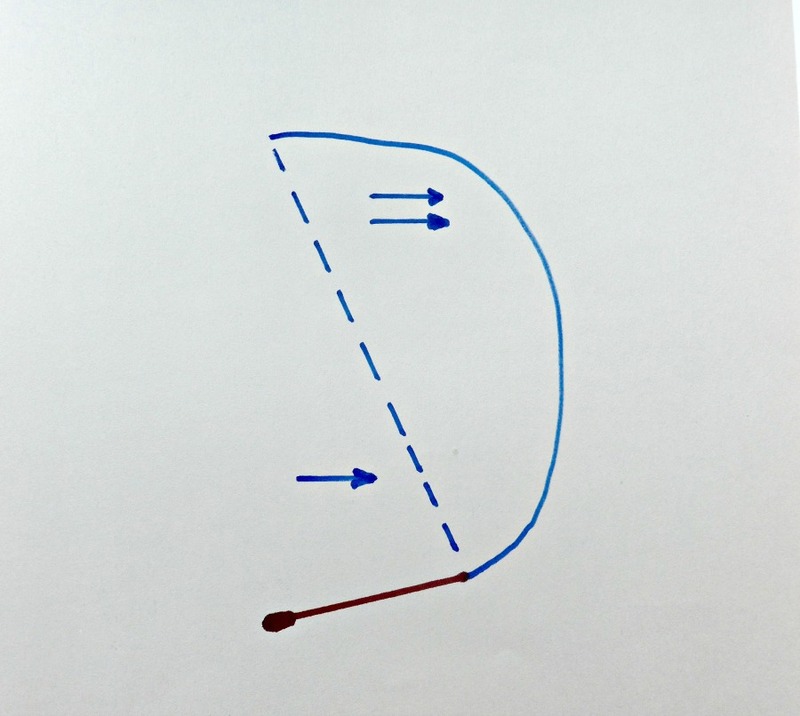 Once the line is on the water, there are two ways to make adjustments for extending the drift. The first is to provide or feed additional line. This is easily done by keeping some additional loose line outside the reel, and using the hand to flip the rod-tip in the direction of the drifting fly. Each flip can usually provide about a foot of line, so a series of flips is generally needed to keep the fly drifting without drag. Another technique is the “water mend”. 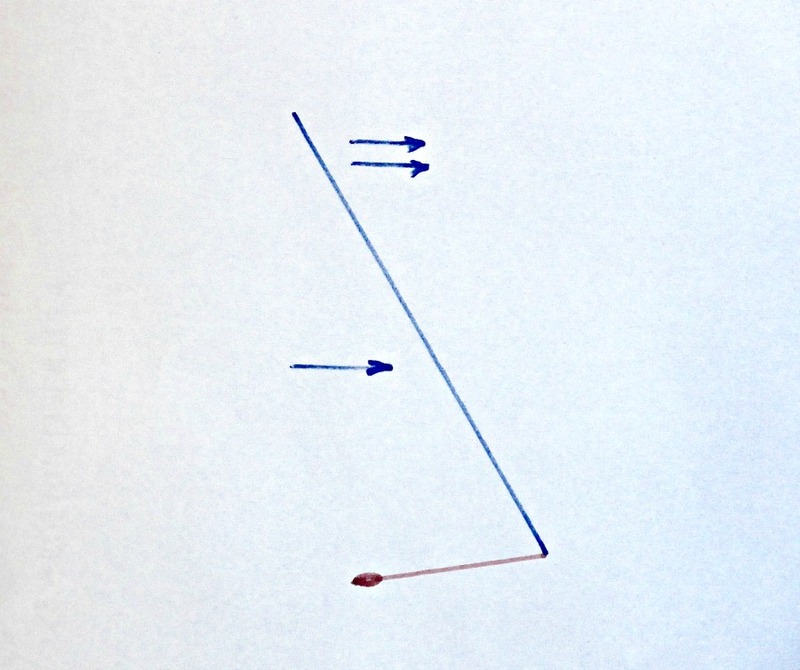 When the line is dragged, a “V” is formed at the juncture of the fast and slow moving portions. To prevent the fly from being dragged along with the line, the mend must be performed before the leader has been pulled tight. The mend is begun by raising the rod-tip and lifting line off the water. It must be lifted beyond the “V”. The line is then flipped downstream if the line is moving more slowly than the fly, or upstream if the line is moving faster than the fly. 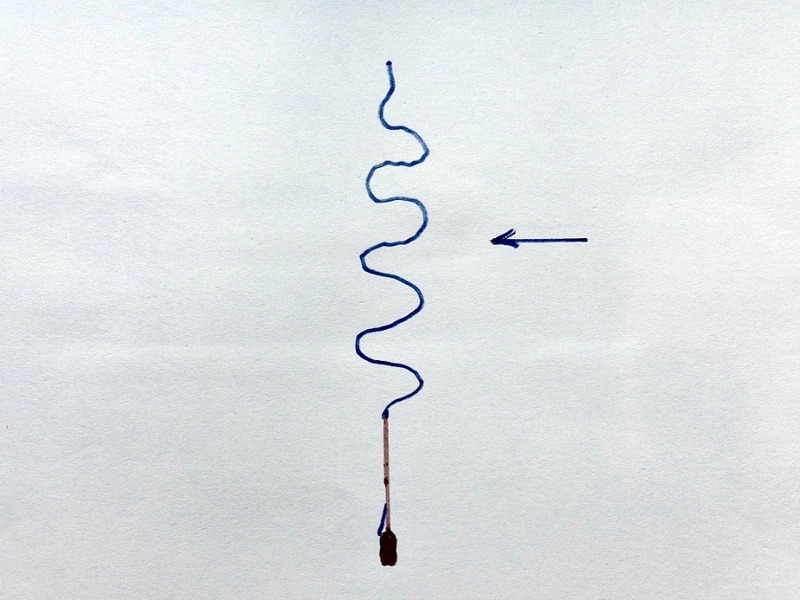 The illustration below depicts an upstream mend, to counter a faster, midstream flow. It is difficult to do this at just the right moment and avoid lifting too much line. If too much is lifted, the fly will be dragged in the effort to avoid drag. Water mends require considerable on-the-water practice. But fortunately, the necessity of a water-mend can usually be avoided by using one of the casts described above. Learning a variety of casts and line-handling techniques for extending the drift takes practice. But their skillful application will vastly improve the presentation of artificial flies. This will result in more frequent “takes” and put more trout into the net. The time taken to master these skills is well worth it. written by Al Simpson, March 2017. Really enjoyed your new article!! Explained very well. is Boulder Creek in Colorado? There is a Boulder Creek in Colorado. In fact, I’ll try some of the flies you gave me as well as some new ones when I go there in May. Hope you are doing well Doc! doing well here; hope the same for you! have a good time in Colorado; should be perfect in May.